Life with Lesley: BFS #117 — Say It In Signs! Memory Verse: Genesis 1:14 (King James Version)And God said, Let there be lights in the firmament of the heaven to divide the day from the night; and let them be for signs, and for seasons, and for days, and years. Intro: This week the other Teachers and I want to shake things up a bit! We wanted for everyone to have some fun and have an assignment that would be easy and enjoyable too. This is a creative blogging assignment but hopefully it will offer help to some newer bloggers still trying to learn “how” to add pictures to their blogs and also help learn your classmates names to easily identify them…and it’s just FUN! 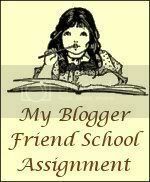 Assignment: This week you are to use your Blog Name (or your own pen/real name) and create signs. This was a super fun assignment...I think I could just keep making new signs. It's addictive!! This is a fun assignment. Great signs. I like how you didnt use just your name, but others. Really cool! The tree carving is adorable. I was going to use the license plate too, but my words were too big. Fun stuff! I'm going to have to go back and try some others. Yours are pretty neat.